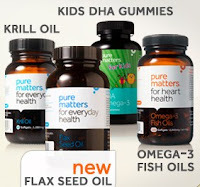 Head over to 8moms to score $40 worth of vitamins, minerals and more healthy products from Pure Matters for only $15.00! I checked out the site and prices are pretty reasonable. I bought the voucher and when I can use the code I plan on buying a bottle of melatonin (for better sleep), green tea extract (for energy,alertness, & to curb my appetite) and 2 bottles of biotin (for healthy hair, nails and skin). I'll be able to get all that for the cost of my voucher + get free shipping! Vitamins and supplements are 100% natural, with no fillers, preservatives or additives. high quality, no hidden ingredients. Products are backed by a proven heritage of research and innovation. All returns accepted, up to one year after purchase. No questions asked.